Holidays are coming, holidays are coming! No, we aren’t speaking about Christmas now. We are speaking about something much closer and much spookier. This holiday is loved by both children and adults for it lets you be someone else in a fun and a bit scary way. Yes, you’re right, everything is about Halloween. We loved celebrating it as kids, we loved throwing Halloween parties as teenagers, so has anything changed as we grew up? In fact, nothing has changed and we still love Halloween, for the holiday hasn’t changed at all. Now, we also celebrate it with our colleagues at work. To get the party started, you need to think of your Halloween office decorations to reflect the holiday’s mood. DesignContest has prepared dozens of easy Halloween office decorations for you that will make this holiday unforgettable for your colleagues and you. Treats are as much a symbol of Halloween as scary costumes or Jack-o’-lantern. That’s why they are always highly expected and appreciated. However, if we’re speaking about spending Halloween in your office, giving everyone candies from a bag or a bowl will hardly be a stunning surprise. On the contrary, you can turn treats into gorgeous Halloween office decoration ideas. Do you remember the episode of Friends when Phoebe brought her mum’s skull to put candies in it? (Well, not the real skull, just the one that belonged to her mum). Why not do the same for your office party? 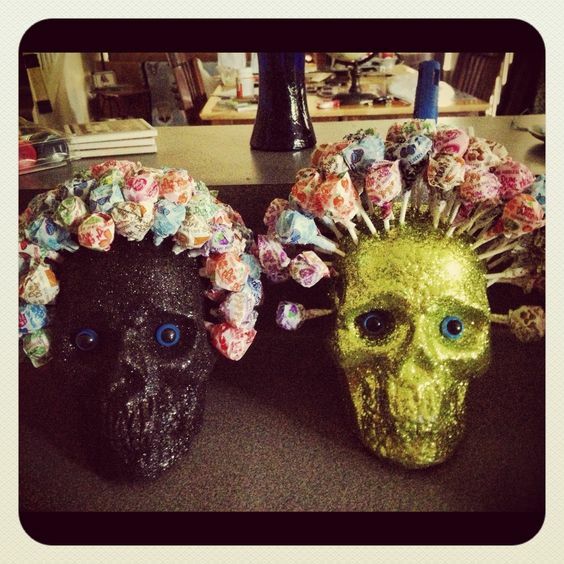 Skulls can replace candy bowls in a great way. They look spooky and fun at the same time. 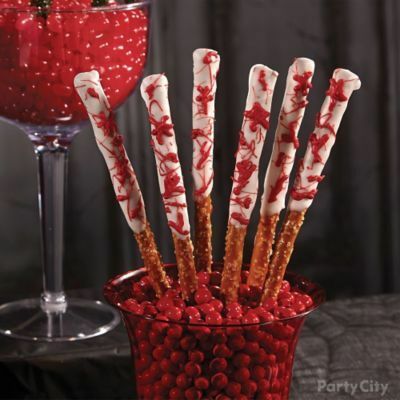 Take a look at these Halloween office decorations that add can add a bit of mystery and sweetness to your office party. What’s more important, they will definitely make you think outside the box. 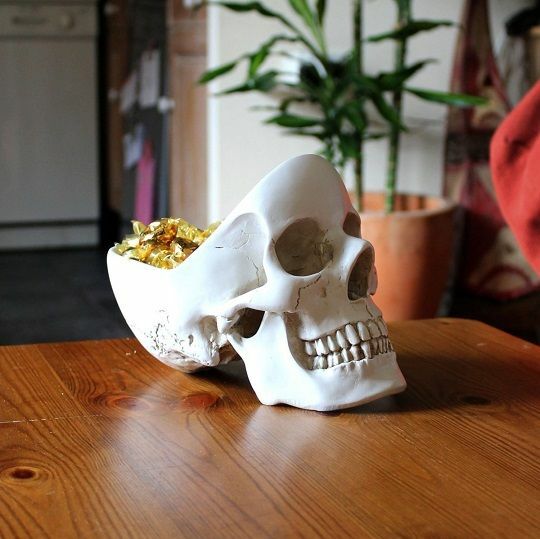 However, if you think that skull bowls are the highest point of what you can come up with when it refers to Halloween office party, you’re deadly wrong. 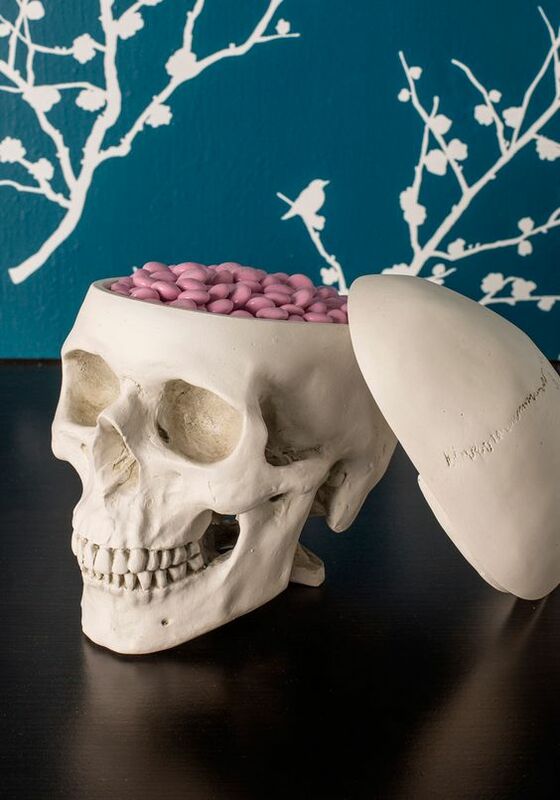 There are also other ways to decorate your office with unusual Halloween candy bowls. 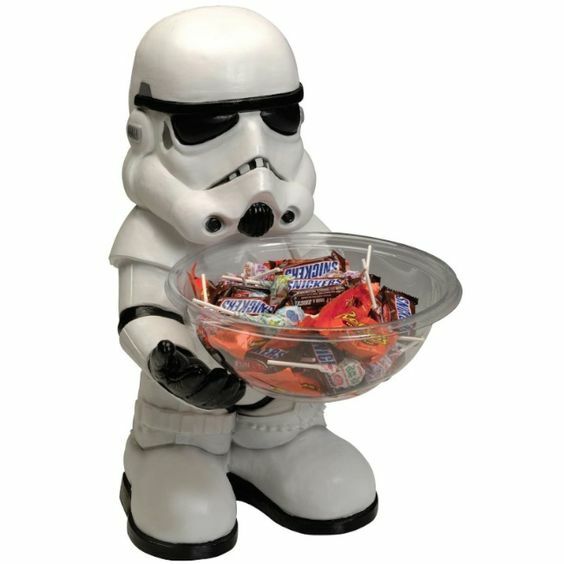 For Star Wars fans, you may want to pick up a couple of Stormtroopers who will be treating your colleagues with sweets. 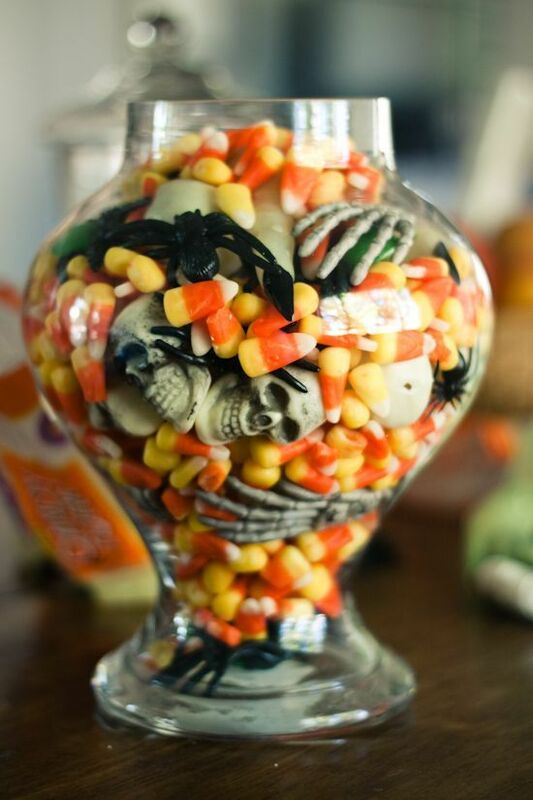 You may also fill in the bowls with colorful treats but don’t forget about a couple of skeletons that should be drowning there. 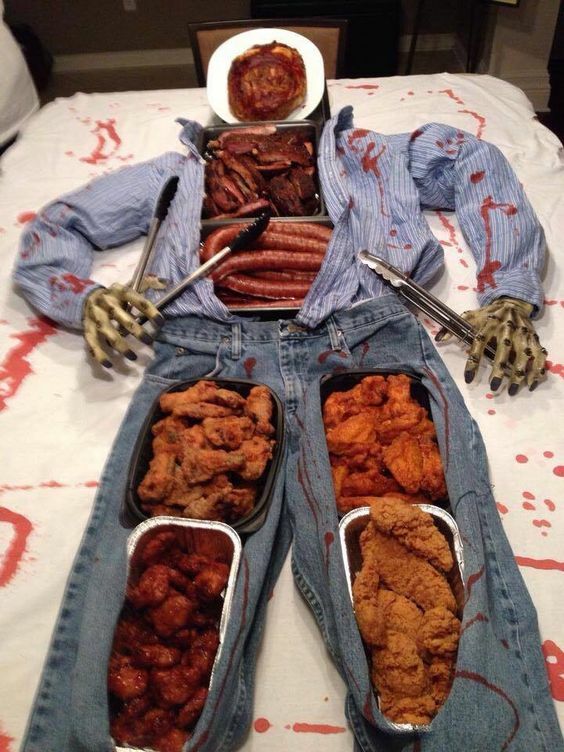 Don’t forget about the food that can be prepared only for a Halloween office party. I mean bloody cool, weird, and dreadfully tasty food. The more blood you add (or cranberry sauce, if that matters), the more your colleagues will be impressed. And a bit nauseous. One of the most important types of Halloween office decorations is Halloween poster design. Sadly enough, people often forget about this part, though it can make your office celebration hilarious. To remind you of how significant these Halloween office decorations are, take a look at the following posters you may totally fall in love with (or get scared of). Just imagine your reaction if you entered the office toilet and found a similar poster there. Raises your mood, doesn’t it? Frightening colorful poster designs may create the atmosphere in the office you’re counting on. As you see, the posters with the Halloween theme will never be odd when you’re looking for Halloween office decorations ideas. Last but not least, let’s talk about your cubicle, the place where you spend most of your time at work. Finding a perfect Halloween costume is as much important as decorating your office cubicle. It’s almost as if you were dressing your working place. Therefore, here are some Halloween office decorations of cubicles that may inspire you. 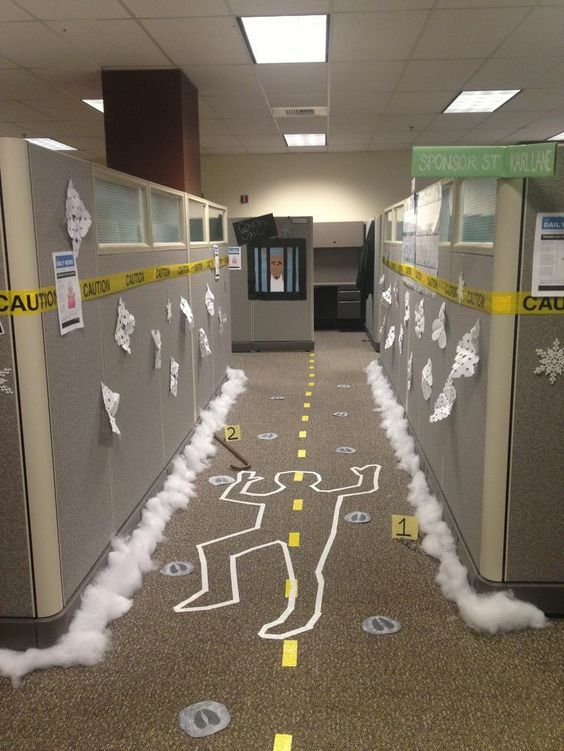 Cubicles are a perfect crime scene for Halloween. I mean, not just the sort of crime you everyone commits at work (e.g. forgetting to put milk in the fridge or taking someone’s cup) but the one with police tapes and chalk on the floor. Looks frightening, doesn’t it? 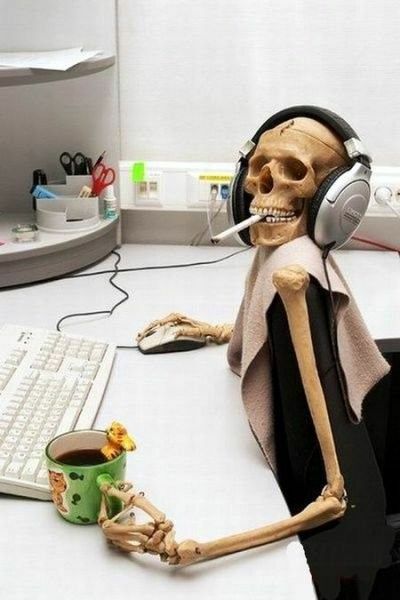 If you want to have some rest and take a break from work, Halloween is a perfect time to do that. You can leave your perfect substitution on your chair and mind your own business, just the way the owner of this cubicle did. There can never be too much web, especially when it comes to Halloween office decorations. Decorating your cubicle with web might be one of the easiest and most astonishing things. 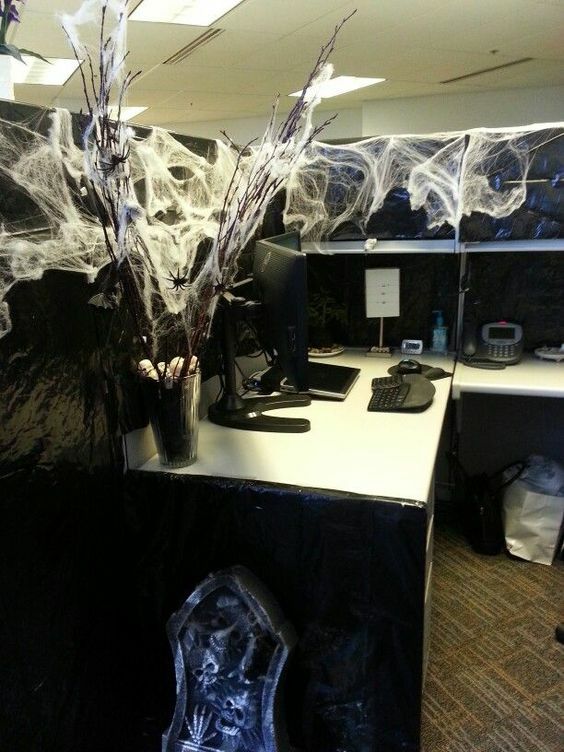 If you have a sort of contest at work on whose cubicle is better decorated, lots of webs give you more chances to win. Oh, and don’t forget about spiders! Never forget about spiders on Halloween! Halloween office decorations aren’t just a part of this holiday. They are vitally important because they raise people’s mood at work and create a holiday atmosphere. People want to celebrate and share their joy with others. In the perspective, it will also raise their productivity. That’s why an office Halloween party is a bloody great idea. And what’s the party without proper decorations? For more ideas on Halloween office decorations, click here.